Color Catcher is an easiest Pick-Color tool, which can pick color from anywhere in the screen. 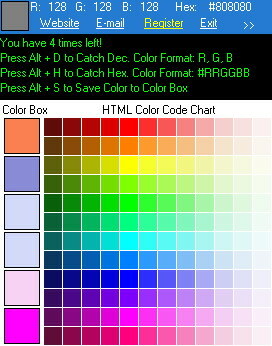 You can use its HotKeys to catch the color code for your RGB, HTML, Delphi, C++, VB, Hex, Decimal and Website design when you want to do it. You can then copy the code to clipboard and use it in other program. It has a friendly and easy-to-use interface, just move the mouse, you'll get the color value you need. Color Catcher is an easiest Pick-Color tool, which can pick color from anywhere. ...... Whether you are a HTML designer, or programmer, you'll find this tool is very useful and we're sure that you'll enjoy this program. * Easy way to copy color code to clipboard. * Outstanding and easy to use Windows user interface. * Support the color code in many kinds of format. * Support the system HotKeys. * Free HTML color codes chart. Color Catcher won't interrupt your work for its thoughtful features. After starting Color Catcher, it goes picking immediately, simply move the mouse and press Alt + D to copy the Decimal color code to clipboard or press Alt + H to copy the Hexadecimal color code to clipboard or press Alt + S to save the color to Color Box, everything will be OK! Yes, it works efficient as you see! Qweas is providing links to ColorCatcher 3.6 as a courtesy, and makes no representations regarding ColorCatcher or any other applications or any information related thereto. Any questions, complaints or claims regarding this application ColorCatcher 3.6 must be directed to the appropriate software vendor. You may click the publisher link of ColorCatcher on the top of this page to get more details about the vendor.